The Cassini space probe has captured an incredible image of Saturn's tiny moon Mimas, suspended against the colourful backdrop of the ringed planet. The image shows Mimas against Saturn's northern hemisphere and the planet's rings (in beige) running across the lower half of the picture. The rings cast delicate shadows across Saturn's northern hemisphere. 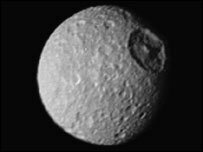 Mimas has been dubbed the "Death Star" because it resembles the moon-sized space station in the Star Wars films. The blue swath of colour behind Mimas (top right of the image) is caused by preferential scattering of blue wavelengths due to the lack of clouds in Saturn's upper atmosphere. The image was taken by Cassini on 7 November at a distance of 3.7 million km (2.3 million miles) from the planet. The dark band that stretches across the centre of the image is the shadow of Saturn's B ring, the densest of the main rings. Mimas is one of the innermost moons of Saturn. It has a low density, indicating that it probably consists largely of ice. Its surface is dominated by a 130 km- (80 miles) wide impact structure called Herschel crater. It gets its name from William Herschel, the German-born astronomer who discovered the moon. The crater is 10 km (6 miles) deep, with a central mountain almost as high as Mount Everest on Earth. The impact probably came close to destroying Mimas. Because Mimas has such a low temperature of about -200C (-328F), scientists think the impact features may date back to the time of the moon's creation. The Cassini-Huygens mission is a co-operative mission between the US space agency Nasa, the European Space Agency (Esa) and the Italian Space Agency (Asi).